Spin Fiesta casino is a mobile casino that knows how to party! Check Out Spin Fiesta Now! When looking at a website, it's important that you get a good first impression. This is integral, especially in this day and age of short attention spans, as users spend on average 0.4 seconds of a webpage before going elsewhere. Thankfully, Spin Fiesta manages to successfully create not just an aesthetically pleasing and functional site but one that had swish and style to it. Complete with flash animations that become more animated the more your interact with the site, Spin Fiesta certainly feels like a party to us and that's not just because of its looks. I think a more appropriate question would be: “Why not Spin Fiesta?” We love a good site that provides lots and lots of good slots here at MobileSlots4U (the clue's in our name) and it fills that criteria and then some. A source of some excellent and popular games with a ton of weekly promotions to boot, we won't blame players for wanting to stay a while. It is such a perfect resource for all of your slot and gambling needs that, honestly, we're surprised it isn't more popular! Although, its popularity may be hindered by a few things that aren't immediately obvious to a first-time player. That's what we're going to look at today. What games does Spin Fiesta not have? 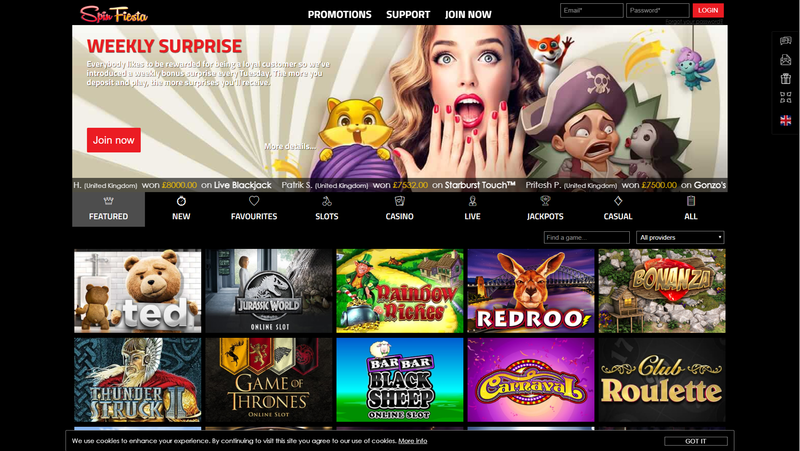 With over two hundred slots from select developers (primarily the best ones like NetEnt, Microgaming and BetSoft), the site is definitely wealthy on the gaming front. There are so many titles to choose from that they are expertly sorted into easy-to-find categories that could make for simple navigation. 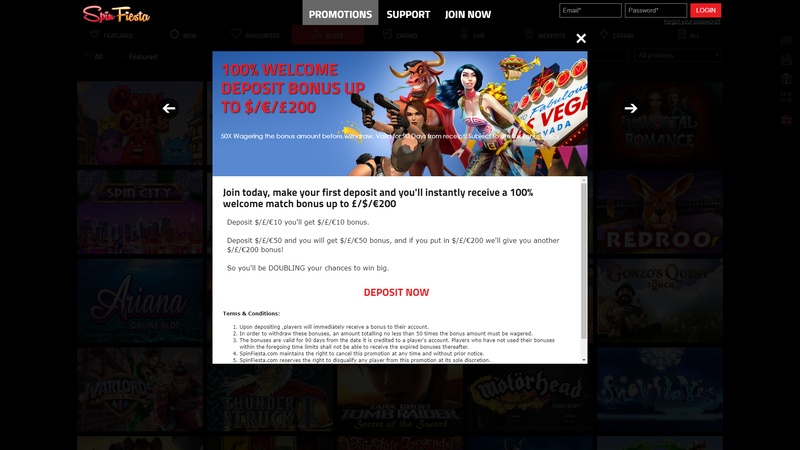 Slots are only one thing that the site provides, however. They also have a dedicated casino section where plays can play virtual blackjack, roulette, and poker. All of this and more is also available live and in various formats too so your choices are not limited. 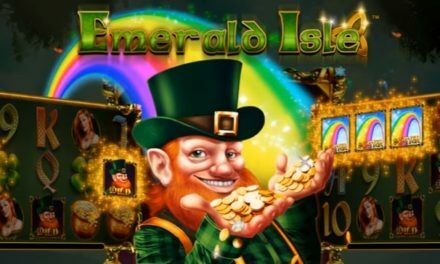 Finally, you get to enjoy a range of progressive jackpots too. So your choice is further widened by the opportunity to earn higher winnings with larger wagers. All in all, Spin Fiesta gets gaming spectacularly right. As we expected. What makes it even better is that all of them are as playable on a desktop computer as they are on a mobile device. When it comes to bonuses and promotions, Spin Fiesta gets it half-right. They have plenty on offer, including many bonuses that are awarded on specific days of the week. These help break the week up and give players a reason to come back, not to mention that they're pretty generous. The welcome bonus alone gives players up to £200 on the first deposit which is a helpful little boost for players. Where Spin Fiesta trips up though is in the wagering requirements. 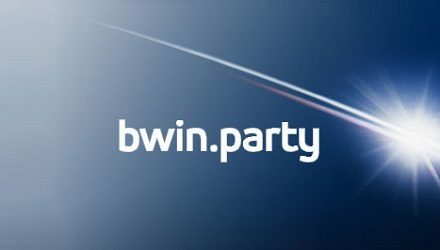 If you're hoping to withdraw on your deposit bonus, you must first meet the 50x wagering requirements, which is quite a lot. In fact, we'd argue that it could be a clincher on whether it's worth joining the site at all, especially for something like a welcome bonus. There's plenty to enjoy at Spin Fiesta regardless of the high wagering requirements. Every Monday and Wednesday, you could get another deposit match. As well as these, Spin Fiesta like to keep things interesting by dishing out some extra promotional stuff every season. This season, you can enjoy the Autumn Gold promotion where you get to win some extra spins. Payment at Spin Fiesta is extremely straight forward. 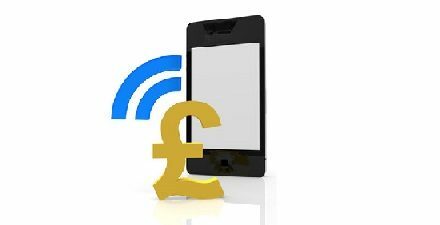 There are many methods, ranging from e-wallets to pay by phone billing. All deposits are instantaneous and the minimum amount is £20. A little higher than average but that's worth it, we think. Withdrawal is also simple. With as many methods as depositing, minimum withdrawals start at £20 and usually take about a day to process, the maximum being three days. It varies from method to method, though, so make sure you check the deposits and withdrawal pages of the site to be certain of these. Customer service may not be the most easily accessible in the industry. There appears only to be a contact form available for players to use. On the other hand, they are extremely responsive to most enquiries and don't pull any punches when it comes to helping people out. Want to play at Spin Fiesta? Spin Fiesta is a mobile casino that throws an awesome party! Spin Fiesta All in all, Spin Fiesta is a great website that offers all the popular games and excellent promotions to go with them. They are a very generous site and it is a wonder why they aren't more popular than they are. The biggest complaint we have is all to do with the wagering requirements. A 50x the original wager is a near-unreasonable amount to gamble with just to withdraw your funds and we urge Spin Fiesta to reconsider if they want to gain more traffic. Overall, however, it is little wonder why those who play at Spin Fiesta want to stay a while. It's a great site with excellent customer service and easy navigation.